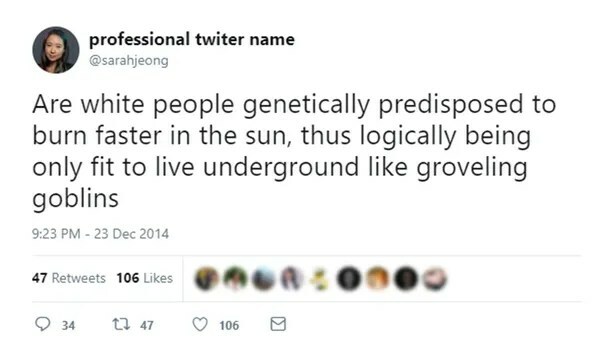 Sarah Jeong is not shy to writing or trolling her harassers on Twitter. 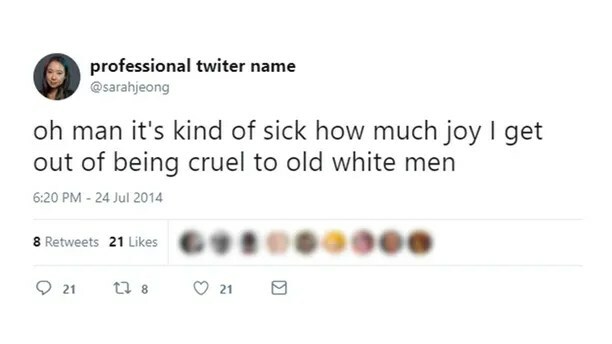 Back in July 2014, several tweets were discovered of her racist demeanor towards white men/people. Now, y’all the inside of me was so happy, because I just knew this was going to say she was being racist towards black folks. Okay, it’s not okay either way but I’m just sick and tired of all the events that are occurring daily with white folks calling the cops on black folks. 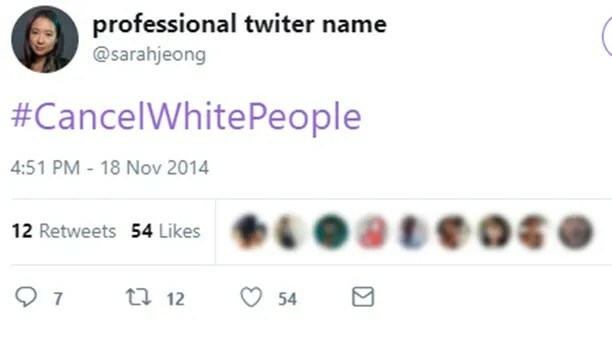 Sarah Jeong and her racists tweets are a disgrace, especially to document on Twitter. Now you know that everyone is going back years to find out the tea on folks. It could have been someone in her office at the New York Times that was jealous the she was hired over their friend. Y’all know how that works. Check out some of her tweets from her racist rant and you decide. These tweets are pretty harsh y’all. You may read more at Fox News of course! Okay, so she has had some bad experiences with white folks for sure. Well, the New York Times made a statement standing by her and that she was vetted thoroughly – uh, not quite. She has since released a statement — not quite an apology but to be fair she was honest in the statement at the time, she was trolling people that were trolling her. She didn’t use a scapegoat like most.